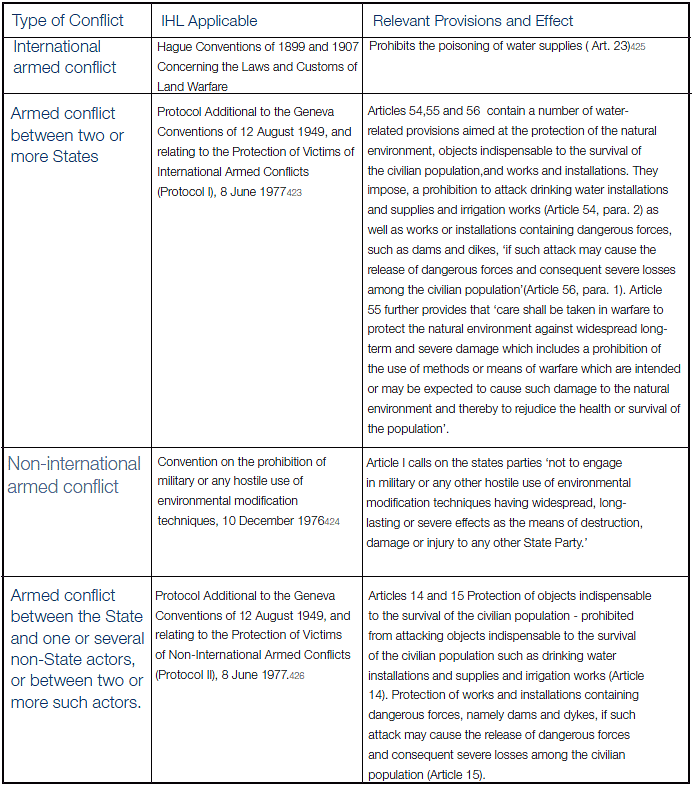 The effect of Article 29 of the UN Watercourses Convention is that during a period of armed conflict where an international watercourse may be potentially affected by warfare, both the laws of international watercourses (the 1997 UN Watercourses Convention) and the laws of armed conflict (see Figure 6.2) will apply (with qualifications) to maintain the protection and prevention of significant harm to an international watercourse and protect a non-belligerent state’s use of the international watercourse. Article 30 reiterates that even under exceptional circumstances of diplomatic breakdown or warfare, where states are unable to communicate in the direct manner envisaged under Articles 9 to 19 of the Convention, states are still under an obligation to cooperate by utilising ‘any other indirect procedure accepted by them’ for the purpose of conveying communications to each other. Article 31 creates a very narrow exception to the requirements of exchanging information under Articles 9 to 19 – with the effect that states are not required to release information concerning a watercourse which is ‘vital to their national defence or security’. What is considered vital to national defence or security is interpreted very narrowly and this argument cannot be used to justify the refusal to co-operate in connection with the application of the principle of equitable utilisation and of the no harm rule unless these reasons constitute a ‘state of necessity’ argument. Article 32 sets out ‘the basic principle that watercourse states are to grant access to their judicial and other procedures without discrimination on the basis of nationality, residence or the place where the damage occurred’. This means that where significant harm is or is likely to be caused by activities in one state, which may adversely affect foreign nationals who are residing in that state or such harm crosses international boundaries, potentially affecting the citizens of another watercourse state, both classes of persons have the procedural right to pursue their claims and seek remedies in the domestic courts of the country where the cause of injury originated. 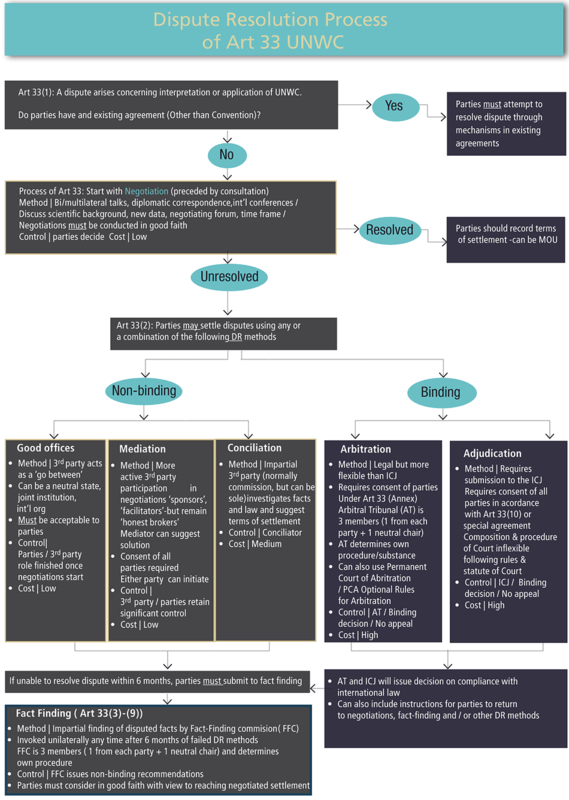 For a summary of the procedure of dispute settlement under Article 33, see the UNWC Dispute Settlement Table (Figure 6.8). Due to a range of converging factors – future conflicts over water are predicted to increase in both frequency and intensity.416 The importance of understanding the contribution that Part VI of the Convention can make to resolving potential conflicts-of-use through effective dispute resolution mechanisms is pertinent to addressing the global water crisis. Clarifying the relationship between the Convention and the other bodies of international law as they apply to armed conflicts involving an international watercourse is also increasingly necessary. Moving forward – exploring how the wealth of knowledge surrounding the creation of the Convention can support the provision of water security and conflict management in an increasingly dynamic and complex global situation- is an opportunity that should not be missed. In general terms treaties give rise to numerous disputes about their interpretation or application. Most treaties prescribe how disputes will be settled and potential conflict will be managed. Dispute settlement in general covers a broad spectrum of rules, procedures and mechanisms, all consistent with the UN Charter requirement that international disputes between nation states be resolved peacefully – ranging from formal dispute management such as judicial adjudication through to more diplomatic methods of negotiation. Part VI of the Convention covers conflict management and dispute settlement – Article 33 was the subject of particularly intense debate during the negotiation and drafting of the Convention and continues to cause apprehension for states considering becoming a contracting party – though it’s full force and effect is largely misunderstood and will be clarified in this section. The Maplecroft Water Security Risk Index in Figure 6.1 shows areas where water resources are under the most pressure and this is directly correlated to those areas which are most prone to future conflict over water resources. 416 PH Gleick, Water Conflict Chronology (2008). 423 Protocol Additional to the Geneva Conventions of 12 August 1949, and relating to the Protection of Victims of International Armed Conflicts (Protocol I), 8 June 1977. 424 Convention on the prohibition of military or any hostile use of environmental modification techniques, 10 December 1976. 425 Hague Convention No IV Respecting the Laws of Customs of War on Land (October 18 1907) Annex Art. 23. 426 Protocol Additional to the Geneva Conventions of 12 August 1949, and relating to the Protection of Victims of Non-International Armed Conflicts (Protocol II), 8 June 1977.